but in gratitude and joy for today, which is the message of RENT"
Could you describe the process and situations that took you from the touring production of RENT to its exciting performances at the Hollywood Bowl? I was on the final touring production of RENT for its last 1 1/2 years, that eventually was part of the DVD called "Rent: Filmed Live on Broadway - the Final Performace." Many of the cast members went on to the Rent: The Broadway Tour with Anthony Rapp and Adam Pascal and while we were in Los Angeles, we met Neil Patrick Harris (a member of the RENT family since he played "Mark" in a national tour of the Tony-winning show that ran at the Ahmanson Theatre in 1997). A year after this meeting, Neil held audition for the Hollywood Bowl production that will be performed at the Hollywood Bowl on August 6-8, 2010. In addition to Neil, Jonathan Larson's father (The show's creator, Jonathan Larson, died suddenly the night before the off-Broadway premiere) and Tim Weil (original music director).were also at the auditions with the Hollywood Bowl staff. This is a new production, but keeping the theater tradition of the original version by keeping some of the original members of the cast. After I auditioned for the production, they asked me to portray the role of "Angel." 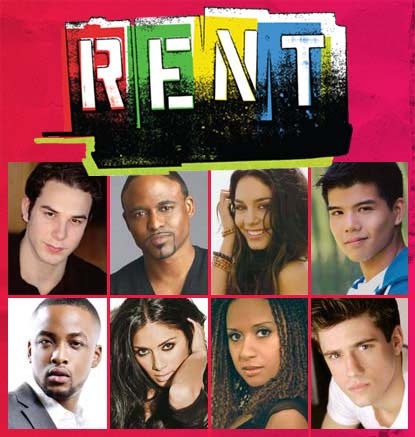 Rent, written by Jonathan Larson and directed by Michael Greif, opened at Broadway’s Nederlander Theatre, on April 29, 1996 following a history making, sold out, extended limited engagement at off- Broadway’s New York Theatre Workshop. The musical went on to win every major best musical award, including the Tony Award, as well as the Pulitzer Prize for drama. Rent is the seventh longest running show in Broadway history. Adam Pascal - In 1996, Adam auditioned for the then unknown, off-Broadway production of RENT. He landed the role of Roger Davis--one which he would reprise a few years later in London, in the 2005 movie version, and again 11 years later for a limited run on Broadway during the summer of 2007. Anthony Rapp - He is best known for creating the role of Mark Cohen in Rent‘s original workshop, Off-Broadway, Broadway, Chicago, and London productions. He also appeared in the feature film version. Getting to play ANGEL once in a while is nothing short of a dream. What a role! When I first started as an understudy at RENT, I was encouraged by the powers that be to not simply understudy and fill a vacancy for the night – but to find my own Angel. When I was first learning the show, I was able to watch three amazing Angels in my time at RENT - Justin Johnston, Shaun Earl, and Andy Senor. I learned so much from watching these three actors. All of these brilliant actors brought their own sense of truth to this character, and I watched the show live and breathe differently when they were playing the role. Have you played the role of Angel before and did your upcoming role as Angel required additional training, different skills and/or practice that provided the needed comfort to get into the role's "skin." The role of Angel is not new to me and is a role that I loved to play. I've understudied the role of Angel on Broadway (that provided many opportunies to perform the role) and did it a lot on the tour (he has performed it at places such as Newark and Rochester). When I was first learning the role of "Angel" - my dance captain, Owen Johnston, shared to me (and the other actors that played Angel) that it would be good to practice singing the role while running so that one wouldn't get winded by the end of the show while performing the character on stage. When I was doing this in New York, people would look at me funny - but this method of practicing helped me. A New York City drag queen who enters the lives of the other main characters in the stage musical and film, his story is one that resonated with a generation and a subculture, and continues to appeal to new groups of younger people who are just now discovering one of Broadway’s most famous productions. What are the differences and similarities between the Hollywood Bowl and Broadway versions of "RENT?" There are a lot of people that haven't been in RENT before such as Vanessa Hudgens, Nicole Sherzinger and Wayne Brady performing with people who have been in previous productions. I'm sure that Neil has innovative ideas on how to stay true to the original while doing it "our own way" at the Hollywood Bowl. Neil has the task of adapting a production that started in an intimate small theater in downtown New York - prior to the Nederlander Theater - and now will be will be performed in one of the most non-intimate venues. Recognizing the logistics of one of the largest venue in the United States, it will be a slightly shorten version of the original. Neil Patrick Harris has stated "With this gang, I'm hoping to provide an eclectic mix of experienced RENT performers, amazing new talent, and recognizable faces in unexpected roles. Of paramount importance to me, though, is honoring the piece as a whole - the music, the vibe, the creator - so that those who have never experienced RENT will be able to appreciate it alongside die hard fans. We'll only have one week of rehearsal, which I like to call 'madness', but as of now my hopes are very high." He also states that "the staging will pay homage to director Michael Greif's original New York production, but "I don't want it to feel like a stop on the national tour." Tim Weil has expanded the orchestrations for the Hollywood Bowl version by having a 12 piece band that includes real string and horn players that adds to numbers like “Take Me or Leave Me” and “RENT” while enhancing the images that will be shown on the two jumbotrons that will be utilized. The ensemble for the Bowl version of "Rent" will include 25 performers, 10 more than the usual cast of 15, performing on a multilevel set designed for the production. Jamal Sims, who was an associate choreographer of the film Hairspray, co-choreographed the 82nd Academy Awards, and was assistant choreographer of the Madonna: Sticky and Sweet Tour, has been announced to choreograph, working with Neil Patrick Harris who makes his debut directing a musical with this production. What aspects and/or performers of the Hollywood Bowl production are you most excited about in experiencing and have you worked with Vanessa and Nicole before? I have never worked with Vanessa Hudgens or Nicole Scherzinger before, though I am very excited to perform with them because I am a fan of their respective works with the Pussycat Dolls and High School Musical films. I can't wait to work with Wayne Brady. I am a BIG fan of his since his days on "Whose Line Is It, Anyway?" He is one of the funniest man I know, along with being a brilliant master of improvisation. He is not new to theater since he has been on Broadway before playing Billy Flynn in "Chicago." I think that he was perfectly cast and Neil has brought together a very good and unique cast. Wayne Brady - He is an actor, singer, comedian and television personality, known for his work as a regular on the American version of the improvisational comedy television series Whose Line Is It Anyway?, and as the host of the daytime talk show The Wayne Brady Show. He was the host of FOX's Don't Forget the Lyrics!, and currently hosts the 2009 revival of Let's Make a Deal. DID YOU KNOW THAT TELLY . . . . When I was in high school, I slept on 41st street the first summer that RENT debuted on Broadway and got my $20 front row rush seat. This was before they did the lottery system – and it was first-come-first-serve, so I was there from 5 AM in the morning! One moment that still touches me emotionally EVERY time is “Without You”. I love the way Michael Greif has staged this moment – to reflect the passage of time with the three couples on stage. As Angel, the passage of time signifies the disease taking him further (and in some ways, closer) to Collins and his friends. As Angel, this moment always feels like a tug of war of emotion. Excited to hear how your background as the son of Chinese immigrants (Judy and Stephen Leung) brought different and unique perspectives to your role as Angel in the Hollywood Bowl's production of RENT? There is no ethnic specificity attached and/or part of the description of the role of "Angel" - or to any other role in RENT. The writer of RENT (Michael Grief, the original director of the Broadway show was also the artistic director of the LaJolla Playhouse that Neil Patrick Harris was part of the cast playing the role of "Mark Cohen") wanted a cast that represented the diversity of New York city. The role has been played by actors that are White (Justin Johnson) and Hispanic (Wilson Heredia). There has been other Asian actors playing "Angel" such as Jose Ilana before I played the role. In RENT, there is a fine between "acting" and "being" because there is nothing to hide behind. As the show was developed, it was actors on stage having an honest moment with one another with no costumes. What made the show so real was that one had to bring whatever they have at that moment that is honest in those shoes or heels that night. I bring "all who I am" (race, background, history, culture, etc.) to my role every night that I perform. When another actor is portraying Angel, they will bring everything that makes them who they are to their own portrayal of the role. There is a fine line between Telly and Angel and that is what makes the show works and makes it different than most other productions. What has playing the role of "Angel" taught Telly Leung? I see "Angel" as somebody who understands that one's time on earth is limited and each moment is precious. He understands that he is terminally ill he realizes that he has to make a choice - to choose to live in the fear of dying or choose the joy of living every moment to its fullest. He makes the choice for the latter. Doing the role has taught me that I must make that choice. You never know where you're going to be the next day and every day is a gift. That's what the role has taught me. I believe that the role has changed me more than I changed the role. I've learn more from doing the show than I can teach the show. That's what doing the role of "Angel" has taught me - to live every day/moment to its fullest . . to choose to live not in fear but in gratitude and joy for today, which is the message of RENT. When somebody loses somebody (like Angel, who dies halfway through the show), his group of friends are constantly reminded this motto when he is gone. After the Hollywood Bowl run, what is next for the production and Telly? 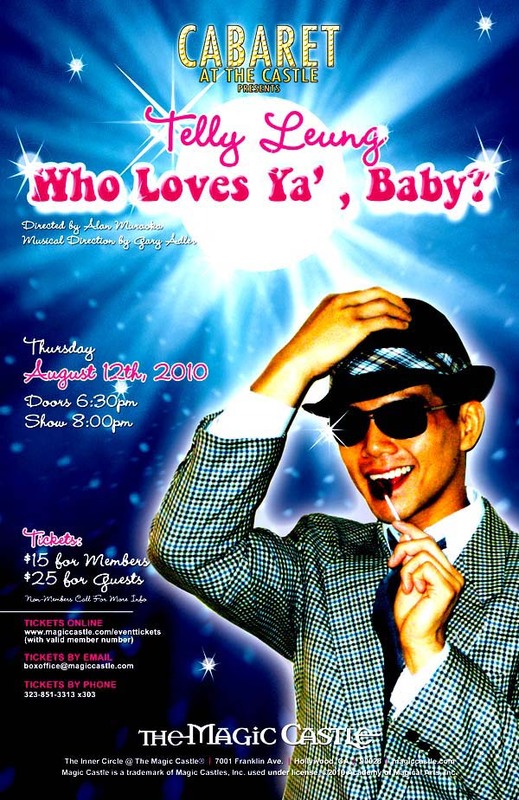 Last week, I premiered my one man show (Who Loves Ya, Baby) in New York that I've been working on with Alan Muraoka. This actor/theater director currently plays Alan - the current owner of Hooper's Store on the television show Sesame Street. Gary Adler provided the musical direction. Some of the many credits this NYC-based American composer has received are two 2005 Drama Desk nominations for his music and lyrics for the off-Broadway show. In addition, he has served as the musical director for shows such as Avenue Q, . His other NYC conducting credits include Chita Rivera: The Dancer's Life, Urinetown, The Fantasticks and Nunsense. Alan and I collaborated on a show that is a tribute to my Mom and Dad. When my parents first arrived in New York, they didn't speak English. They learn how to speak by watching television and listening to vinyl records of music from the 1970s. While my parents grew up on Neil Diamond, I grew up on Sesame Street. For my show, I raided my dad's vinyl record collection of 1970's music to peform songs from that era. "Who Loves Ya, Baby" is the catch phrse from my mom's favorite show Kojak. I was named after the show's lead character Telly Salavas. This show is a love letter to my parents, though they didn't always show support my show business aspirations, i wanted them to understand they are the reasons why I am doing what I am doing. Telly Leung States ""Meet Judy and Stephen Leung — my parents — who immigrated to this country in the 1970's from China, and used TV and vinyl records to learn English and become American . . . . It's a celebration of THEIR music, so get ready to hustle, bus stop, and boogie-woogie your way back in time as I go through my Dad's incredible 70's vinyl collection." Telly promises to bring you selections from the songbooks of artists such as Neil Diamond, Bee Gees, Barry White, Johnny Mathis, Simon and Garfunkel, Chicago and other songs that were his parents listened to learn English while becoming favorites to Telly. The concert will be at 8:00 P.M. on August 12, 2010 at Cabaret at the Castle, Los Angeles, CA ( 7001 Franklin Ave. / Los Angeles, CA 90028). To purchase tickets, call 323-851-3313. Unconditional - they can make you so happy and so angry, but no matter what - they are your parents.